The girl with northern hair style in night outfit. When we visited a small workshop owned by a group of the young Vietnamese artists in Hanoi, we loved their work. Most of them graduated from Hanoi Fine Art College or Hanoi Industrial Art College. They are the talented artists and hardworking people. Their art is simple and beautiful as their country, Vietnam. Each painting is original piece of art. The paintings celebrate the harmony between people and nature, and the love for the country. 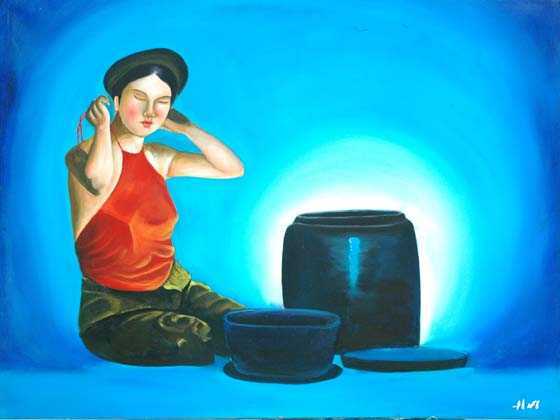 Our favorites are Vietnamese landscape and rural sceneries, and we decided to carry them on our website because we think that they are the beautiful artwork which also is very close to every Vietnamese's heart.